Meatless Monday - each Monday we strive to eat no meat dinners to help both the food budget and our waist lines. "Verde" Divided Dish - Olives are perfect for Meatless Monday. Some meatless Mondays have included bean and cheese enchiladas, falafel burgers, soy crumble chili and the worst dinner ever mushroom stroganoff. That mushroom stroganoff was the worst thing we have ever tasted. THH and I say if something tastes better than mushroom stroganoff it was a success. I mean that stuff wasn't even eatable. Last Monday we had something new. A tofu lettuce wrap and white rice. It wasn't bad. THH even said he liked it (gasp!) and had like 6 of them. 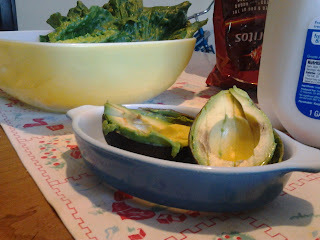 It was also a chance to use my Verde divided dish. I picked this guy up at SA for $8. A bit pricey, but it has the olive lid and no marks. I wasn't a happy campers that day. I got half way home and didn't turn the coffee pot off at work and had to drive all the way back since I was the last to leave. Way to ruin a good 25 minutes of my alone time on a Friday afternoon. But at least SA came through for me and had the Verde, and the cool patterned lid. Thanks SA for making my day a little brighter. Heat oil in a skillet over medium-high heat. Throw in the tofu, then break it up into very small pieces. Cook tofu for several minutes, until much of the liquid cooks off and tofu starts to turn golden. 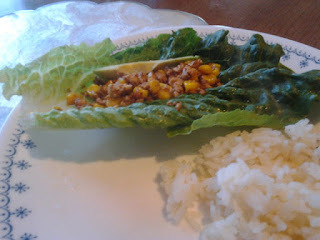 Add taco seasoning, water and soy sauce, then cook until most of the liquid has been absorbed. Pile mixture into romaine hearts, garnish with avocado. The lettuce and avocado make the dish. The filling alone was like "eh" but combined it was pretty darn good. I couldn't not use other Pyrex. In the spirit of spring (which is not hanging out here in Long Beach) I used a turquoise pixie to hold the avocado. "Cado" as THM was calling it. And the large yellow bowl to hold the Romain hearts is the big bowl to a hostess set. I don't have the lid or the Small bowls but picked it up for $5 at SA during a large haul that day. And of course the plates are snowflake Corelle. I haven't taken the Meadow Corelle out, maybe that is why spring hasn't been here yet. 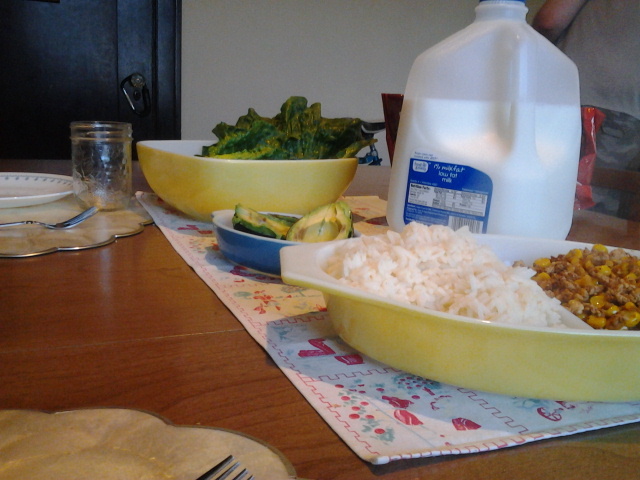 (This was last Monday's Meal) It is so nice have an collection of Pyrex. Makes it all so pretty. By the way: our dinner discussion was do people use their left or right hand to eat with in India? I was right, and it is their right. They use the left hand for um.... Wiping and other ewwwww things. nice dinner talk huh?! Don't shun the orange goodness of Doritos either!